Health concerns • Officials say tests show serious risks for people, animals. Rick Egan | The Salt Lake Tribune The shore of Utah Lake, looking north toward Lindon Marina, Thursday, July 14, 2016. Courtesy of the Utah Department of Environmental Quality and Utah State Parks. 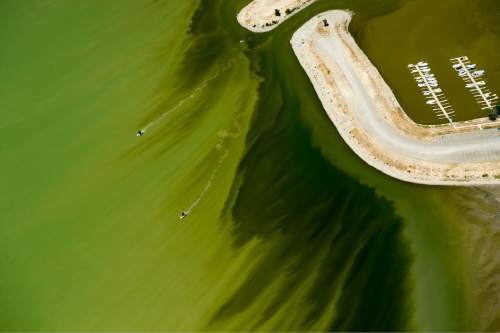 A large toxic algal bloom is growing on the eastern Rick Egan | The Salt Lake Tribune Discolored water in Utah Lake, looking south from Lindon Marina. Crews took samples of a mile Rick Egan | The Salt Lake Tribune Thursday, July 14, 2016. 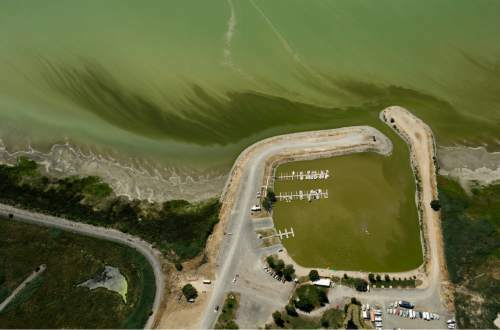 Rick Egan | The Salt Lake Tribune Discolored water at Lindon Marina. 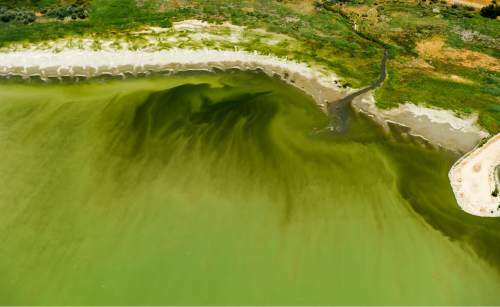 Crews took samples of a mile-long algal bloom at Utah Lake Rick Egan | The Salt Lake Tribune Discolored water in Utah Lake, near the Lindon Marina. 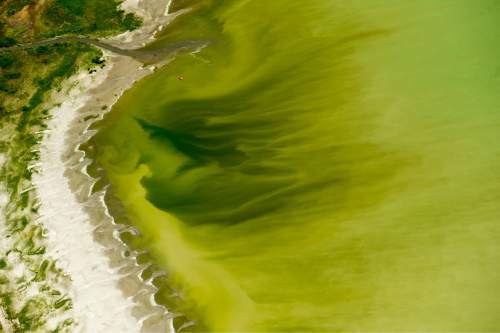 Crews took samples of a mile-long alga Rick Egan | The Salt Lake Tribune A couple of boats mother through the discolored water in Utah Lake, near the Lindon Marina. C Rick Egan | The Salt Lake Tribune Water in Utah Lake near the Lindon Marina is discolored last week. Rick Egan | The Salt Lake Tribune The shore of Utah Lake, looking north toward Lindon Marina, Thursday, July 14, 2016. Courtesy of the Utah Department of Environmental Quality and Utah State Parks. 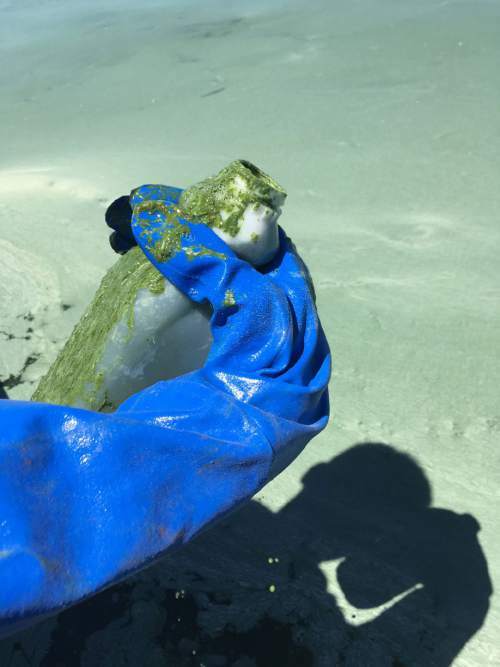 A large toxic algal bloom is growing on the eastern shore of Utah Lake; people and pets are advised to stay out of the water. Rick Egan | The Salt Lake Tribune Discolored water in Utah Lake, looking south from Lindon Marina. Crews took samples of a mile-long algal bloom at Utah Lake on Wednesday evening. They'll know today if it's toxic and if they'll need to enforce closures. Thursday, July 14, 2016. Rick Egan | The Salt Lake Tribune Thursday, July 14, 2016. Rick Egan | The Salt Lake Tribune Discolored water at Lindon Marina. Crews took samples of a mile-long algal bloom at Utah Lake on Wednesday evening. They'll know today if it's toxic and if they'll need to enforce closures. Thursday, July 14, 2016. Rick Egan | The Salt Lake Tribune Discolored water in Utah Lake, near the Lindon Marina. Crews took samples of a mile-long algal bloom at Utah Lake on Wednesday evening. They'll know today if it's toxic and if they'll need to enforce closures. Thursday, July 14, 2016. Rick Egan | The Salt Lake Tribune A couple of boats mother through the discolored water in Utah Lake, near the Lindon Marina. Crews took samples of a mile-long algal bloom at Utah Lake on Wednesday evening. They'll know today if it's toxic and if they'll need to enforce closures. Thursday, July 14, 2016. Rick Egan | The Salt Lake Tribune Water in Utah Lake near the Lindon Marina is discolored last week. 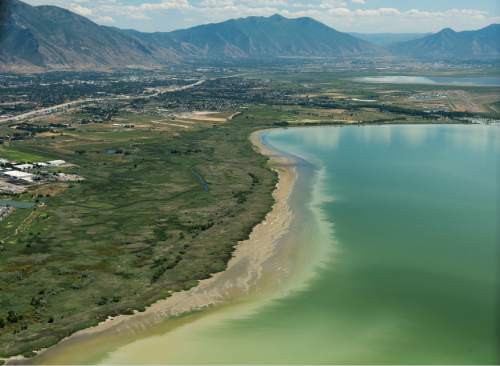 State officials closed the entirety of Utah Lake on Friday after test results confirmed that a large algal bloom poses "serious health risks." 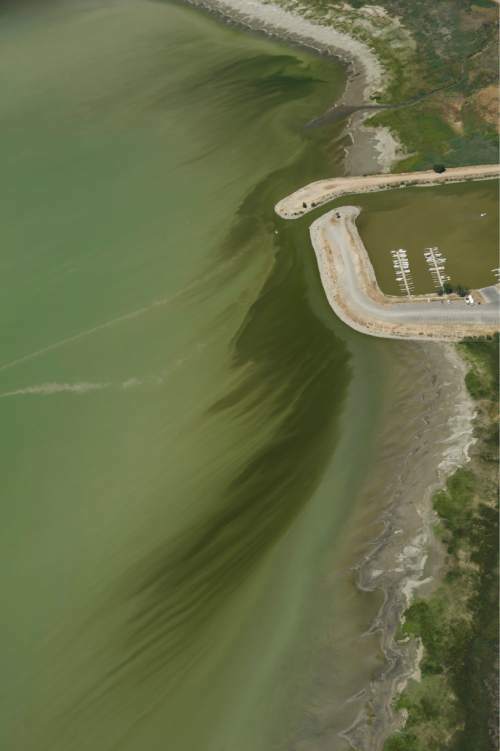 Satellite images show a bright green slick running two miles along the eastern shore from Provo Bay to Provo Harbor near Utah Lake State Park, according to a news release from the Department of Environmental Quality. Several smaller blooms collectively cover 90 percent of the lake. The Utah Department of Health advises that people and animals avoid the water. The algal growth contains toxin-producing cyanobacteria, which causes headache, fever, diarrhea, abdominal pain, nausea, vomiting and allergic reactions with skin contact, the release states. The algae can also affect brain, nervous system and liver functions. If ingested, it can be fatal. Those worried about exposure should contact Utah Poison Control at 800-222-1222 or their physician. DEQ researchers collected samples of the bloom after a recreationist alerted authorities of the growth Wednesday. Initial results received Friday morning show a concentration of algal cells in Utah Lake three times the threshold for closing a body of water, according to the DEQ news release. This is the first time the entire lake has been closed. Officials posted signs around Utah Lake warning of the health risks, but say even if algae is not visible, the water will remain off-limits "until further notice," as toxins can be present even after a bloom has dissolved. More tests results on the toxicity are expected early next week. Utah Lake has struggled with large algal blooms in the past, including in 2014, when the growth poisoned and killed two dogs. Algae is a natural component of many lake ecosystems, but waters with high levels of nutrients, warm temperatures, calm flows and heavy sunlight can develop extensive blooms that pose a risk. Though the blooms die off as part of a natural biological cycle, they can last for days or weeks, depending on weather patterns. Longstanding growths threaten fish and wildlife; DEQ recommends not eating any fish caught in the lake since July 10 and not fishing in rivers near Utah Lake.